Have you ever thought of making your own liquid soap? Are you backing out because it seems tedious? You are mistaken. Read on to know few easy to make homemade liquid soap recipes. How often do we ponder upon the making of items as daily as soap? Every single morning, we rub a soap bar on our body or squirt liquid soap into our hands without giving in much thought to its preparation. For most of us, soap is nothing but soap. And to indulge into the process of making it is like entering the dreaded domains of organic chemistry taught back in school. However, let us refresh our knowledge and make the lesson interesting with tidbits of history punched in. Soap is actually an end product of a complex chain of reactions between two completely opposite chemical families - a base and an acid. Sodium or potassium hydroxide is the most preferred base used, while fats or oil make up for the acidic content of the reaction. The process even has a fancy chemical name called saponification. Now, are you wondering as to what is the product like after saponification? Is it solid or liquid in state? The major difference between bar and liquid soaps lies in the base or alkali used to saponify the fats or oils. In case of bar soaps, the alkali used is sodium hydroxide, while potassium hydroxide is the alkali used in case of liquid ones. Even though the history of soaps can be traced back to the late eighteenth century, William Shepphard first patented liquid soap in the year 1865. Today, the market is virtually filled with racks and racks of liquid soaps, so many that consumers walking down the aisles in the supermarkets are completely confused. If you are also one amongst the many and do not know which one to pick, here is a relief. In the following lines, we have for you several recipes to make homemade liquid soaps. Mix all the ingredients together in a larger pot or Dutch oven. Set the pot/ oven over low heat. Stir occasionally until the soap flakes have dissolved. Transfer it to a jar and cover tightly. In case of watery gel soap, use 1 gallon water. Grate the bar of soap into small flakes and pour it into blender. Add 1 cup boiling hot water and whip. Now, add ½ cup of water at room temperature and stir in blender. After adding honey and glycerin, stir the mixture again. Allow the mixture to cool for 15 minutes. The entire mixture should measure 2 cups. Now, add cool water until the mixture measures to around 5-6 cups. Pour it into a container without lid and allow cooling. Close the lid after an hour. The soap mixture will thicken up. Add the oils in a crock pot. In the lye mixing container, add potassium hydroxide and potassium carbonate to distilled water. Once the lye and potassium carbonate dissolves, add the solution to the oil mixture. Now, cover the crock pot and set it over low flame. Cook the soap for 2.5-3 hours and keep stirring in between. Once the mixture reaches the slimy stage, turn off the flame. Heat 80 ounces of water and add the soap mixture to it. Heat the overall mixture. Stir it occasionally, keeping the lid on. Once the solution blends well, turn off the heat. 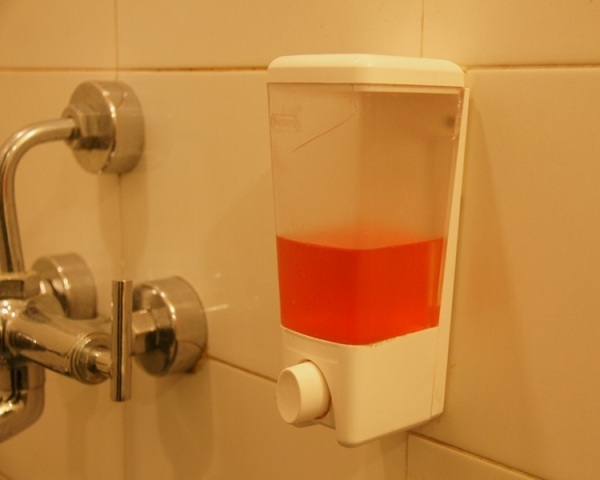 Allow the soap to cool and pour it in a container.